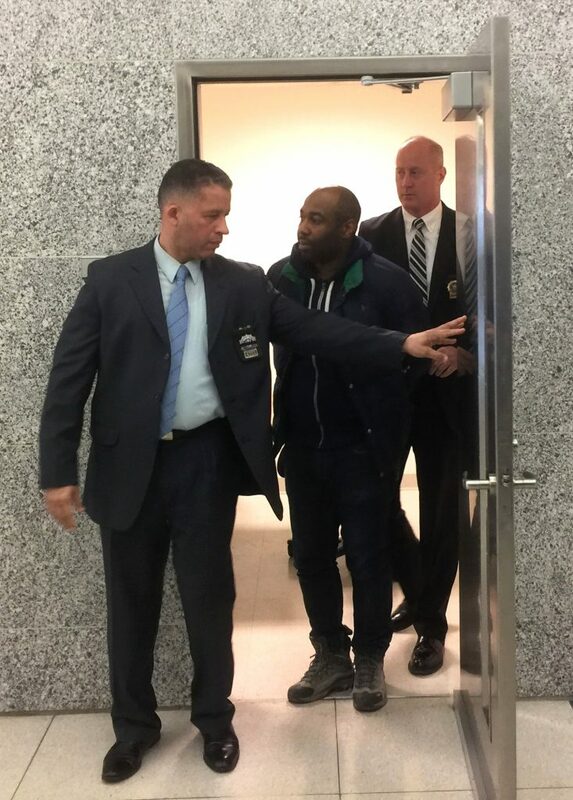 Another man charged in the Menachem Stark, H”yd, kidnapping case has testified against Erskin Felix, seemingly dealing a crushing blow to Felix, accused of kidnapping and killing Stark in a ransom scheme gone bad. Irvine Henry, a cousin of Felix’s, testified Friday that Felix brought him into the plot after Stark had already been kidnapped, bound and gagged in the Felix family minivan. Stark was kidnapped outside his Williamsburg office on January 2, 2014, and his body was found burning in a dumpster in Great Neck, Long Island, the next day. Prosecutors contend that Stark was accidentally suffocated during a botched kidnapping for ransom orchestrated by Erskin Felix and carried out by Erskin and his cousin, Kendel Felix. Following the kidnapping, Erskin and Kendel first picked up Erskin’s brother Kendall Felix, then picked up Henry. Henry testified that he had not been in contact with Erskin for five or six weeks prior to the night of January 2. Henry, along with Kendel and Kendall, worked as a carpenter on construction sites Erskin subcontracted and which were owned by Stark. During these weeks at the end of 2013, Henry was out of work, and admitted to supporting himself with various shady endeavors, such as selling Beats headphones that were likely counterfeit. Henry saw Kendall standing outside the Felix family’s Dodge Caravan, and Erskin, Henry and Kendall got into the van. As he entered the van, Henry also saw Kendel, “and there was somebody inside the vehicle, that was slumped over” in the bench behind the driver. Irvine and Erskin sat in the third row, while Kendall sat next to the slumped-over figure. “I was then told by Erskin that we had just kidnapped and we was gonna hold him for ransom,” said Henry. At one point during the drive, testified Henry, “it was said that the body was unresponsive and was slumped over for a while … I then said that I think that the person’s dead, from observing the person not moving.” Kendall checked Menachem, and it appeared he was no longer alive. Erskin and Henry left the minivan some distance from Menachem’s office and began walking toward the office, while Kendel and Kendall remained, with Menachem’s body. Though Henry may not have been aware, Erskin was likely intending to go to Menachem’s SUV to remove the tracking device he had planted under the SUV several weeks earlier. The pair then hailed a cab to Union Square in Manhattan, where they took a train back to Brooklyn. The next day, Erskin asked Henry to accompany him and Kendall to Long Island, as Erskin wanted Kendall to show them where Kendall and Kendel had dumped Menachem’s body. But in middle of the trip, Erskin said, “Don’t worry about it, turn around,” and they never went to the location. Soon thereafter, Erskin started giving Henry jobs once again. Henry said that in subsequent conversations about the night of the kidnapping, Erskin told him “that the victim had owed him money, in the sum of about $20,000,” and that Erskin said he thought he accidentally suffocated Menachem when he sat on him after the kidnapping. Kendall has already pleaded guilty to second-degree conspiracy and first-degree hindering prosecution, and has been sentenced to 2-1/3 to seven years in prison. Henry has pleaded guilty to hindering prosecution and attempted tampering with physical evidence, and, in exchange for his testimony, is expected to be sentenced to no more than the three months in jail he has already served before posting bail. Kendel was convicted of murder and kidnapping in September 2016. Earlier in the week, he too testified against Erskin, in exchange for which he hopes to receive a sentence of the minimum 15 years to life in prison instead of the maximum 25 years to life. Henry said that he only realized Menachem was no longer alive once they were driving, but Kendel said that Henry noticed Menachem was dead as soon as he came out to the car. Henry said Menachem was sitting on the bench, but Kendel said Menachem was lying on the floor. According to Kendel, some time after Erskin and Henry began walking toward Menachem’s office, Erskin had called him and said “this place if full of cops yo, drive off, drive off somewhere far, get rid of the body … deep in Long Island.” But Henry said Erskin decided to leave only because Henry had suggested it wasn’t wise for them to be seen there and made no mention of hearing Erskin call Kendel and telling him about cops being there, or to dump the body. Another bit of evidence introduced Friday also appeared to corroborate a portion of Kendel’s testimony. Kendel had testified that while he was initially driving with Erskin from the scene of the kidnapping, Erskin had told him to remind him to “call Poppy to go get the Jeep.” “Poppy” was a family nickname for Henry, and the “Jeep” referred to Menachem’s SUV. And on Friday, prosecutors showed text messages they had retrieved, sent by Kendel to Erskin, saying “Call Poppy” “To go get the Jeep.” The messages were stamped shortly after midnight – or around the time Erskin had left the car to speak with Kendall at his home, before eventually returning to the car. In his cross-examination of Henry – much like in his cross-examination of Kendel – defense attorney Mark Henry Pollard sought to paint Henry as a man falsely testifying against Erskin in exchange for a reduced sentence. Much like Kendel, Henry also agreed with Pollard’s portrayals of Erskin as an “older brother” figure whom many family and friends looked up to, and to whom Erskin would give valued advice. Henry began tearing as he told Pollard that since his arrest at the end of 2016, he has not had a close relationship with Erskin’s family. When questioning was over and Justice Danny Chun finally excused Henry from the witness stand, Henry dissolved into tears, and was openly sobbing as he left the courtroom under police protection. Sources familiar with the case have told Hamodia that Henry fears reprisals for his testimony, as does Kendel, who is in protective custody in jail as he awaits sentencing.